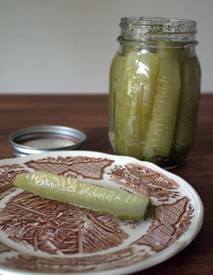 A favorite dill pickle recipe! Even if you don’t have the time to can pickles you can use this recipe to make refrigerator pickles. Just follow the instructions and instead of canning pop them in the fridge overnight. In the morning you’ll have delicious and lightly flavored pickles ready to enjoy, and they will last in the fridge for about a week.